Born December 16, 1770, in Bonn, a city on the Rhine in the German archbishopric of Köln, Beethoven came from a family of musicians. Ludwig grew up in poverty, and his father was a violent and rough man, so Ludwig’s childhood and youth were not happy. Hoping to make money off his son’s musical talent, the father forced Ludwig to undergo a severe musical training from his fifth to his ninth years. After that, he received lessons on the piano, at which he excelled. As a teenager, Ludwig began supporting his family after his father, a singer, could no longer find employment. It was the archbishop-elector of Köln who, recognizing Beethoven’s musical talent, sent him to Vienna in 1792. 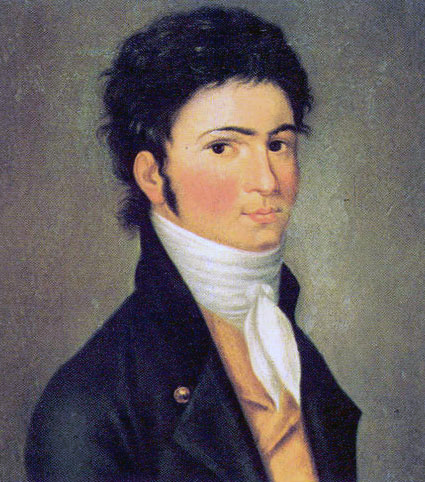 In the capital of the Austrian Empire, Beethoven earned the reputation of a great piano virtuoso and began composing works for piano solo, quartets, and symphonies. His first and second symphonies, performed in 1800 and 1802, were very much in the classical style; but his Symphony Number 3, premiered in 1806, was the first of his truly Romantic works. Called the Eroica (“Heroic”), the Third Symphony was originally written to honor Napoleon. (Beethoven removed the dedication when Napoleon proclaimed himself emperor.) The Eroica Symphony was longer than the symphonies of the time and contained passages of soaring heroism and poignant sadness. Indeed, in his remaining six symphonies and in his other works, Beethoven showed the emotional power that music can express. And he inspired an entire generation of composers to follow the Romantic ideal. The depth and beauty of Beethoven’s music arise, perhaps, from his sufferings. In 1798 he detected the first signs that he was going deaf. As the years passed, his deafness grew worse until, by the early 1820s, he could hear nothing at all. This ailment caused him to withdraw himself from the society of his friends, and his frustration threw him into bitter rages. Though he was naturally gentle and kind, he nevertheless drove people off, for he could not let them know he was going deaf. This he explained in a letter to his brothers, written in 1802. In the letter he described, too, his feelings of despair, from which he said he was saved by his art. Beethoven was baptized a Catholic and outwardly professed the Catholic Faith. But, like so many men of his time, Beethoven was really a Deist. His greatest and last symphony, the Ninth, closes with a choral hymn to the “loving Father” who dwells “beyond yon starry canopy”—but this father is not the Catholic God. It is told, however, that on his deathbed, Beethoven agreed to have a priest come into his room and give him last rites. When the ceremony was over, Beethoven expressed hearty thanks to this servant of Christ. Beethoven died on March 26, 1827, while the heavens raged in thunderstorm. Today, we can scarce understand how strange and revolutionary Beethoven’s music must have sounded to his contemporaries. This film portrayal of the first performance of the Eroica captures the sense of shock, dismay, and even disgust with which the symphony was received by the cultured Viennese of the early 19th century.